I met Jen in third grade. My family had just moved to Windham, Maine from Heber City, Utah. In an effort to harness my energy and desire to perform, my parents enrolled me into ballet classes. With nine kids my mom was busy and asked around about carpooling to and from dance classes, which were held in Portland (about 15 minutes away). 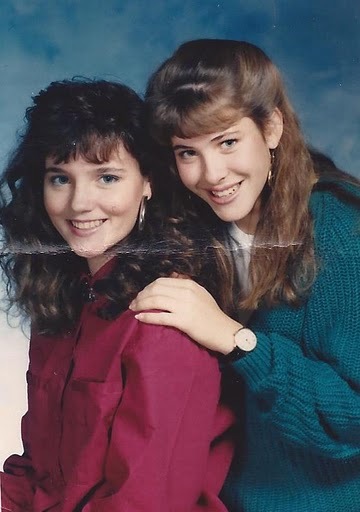 Coincidentally, one of my third grade classmates also took classes from the same dance school, so my smarty momma hooked up a carpool with the other dancer's mom. Sitting in a back seat for 15 minutes while her mom drove us to and from dance class gave me and my carpool pal a lot of time to chat and giggle. Soon, Jen and I were inseparable. Throughout elementary school, junior high, and high school, we did nearly everything together. We even joked that we shared a brain. You know the kind of friend that finishes your sentences, knows exactly what movie reference you're talking about and laughs at all of your dumb jokes? That was Jen. Then, I moved to Utah for college. We slowly fell out of contact. My parents moved from Maine to the West and the only remaining family tie there was a brother with whom I wasn't super close. I would dream about Jen every now and then. Mostly I'd wake up feeling empty and sad. I'd put it out of my mind and tell myself, "people move on and so should I." But, I secretly longed for that connection with an old friend who had known and loved me when I was a chubby, self-conscious dancer worried about the rolls of fat that couldn't be hidden in her leotard. Jen was that friend for me. She always lifted me up and made me laugh. My 20-year high school reunion was two weeks ago. I went to Maine and we reunited. I was just a little nervous that we wouldn't connect...but, I plunged in and just two weeks ago, I got my best friend back. Like old times we laughed, finished each others sentences, and were goofy and wacky together. I felt like a kid. Now we have weekly Skype dates...almost like we're in the back of her mother's car on the way to dance class. There's something to be said about spending time with someone who has known you for 30 years. I love the friendship we had, but I'm giddy over the friendship we're reconnecting and building. So totally wonderful! I love having a friend like that. Those kind of friendships never move on, even if they do get sidetracked for just a bit! Here's to old friends! It makes me so happy that you two are connected again! What a great friendship, one of those that was meant to last!